HMI packages are getting more and more powerful allowing the creation of very realistic graphics. 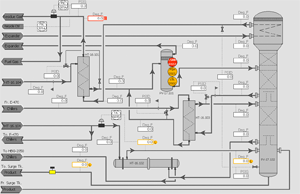 Though we all like to look at, and as designers, want to create, beautiful graphics for our HMIs, studies have shown that there is a simpler is far safer method of graphically representing the process. Enter Abnormal Situation Management, hereafter ASM. We humans are limited as to the amount of information we can process at one time and studies have found that we tend to focus on certain types of visual stimuli differently. For instance, we notice things that are brightly colored or high contrast much more quickly than like colored items. Movement is another attention grabber. Therefore, on HMI displays, we should show the operator what is most important using these visual cues. The ASM Consortium has been studying methods of improving graphic design on operator displays to best enhance an operators ability to visualize and react to abnormal situations of the process. I have used their guidelines (ASM Consortium’s, HYPERLINK "http://www.asmconsortium.org/" http://www.asmconsortium.org/, Guideline for Effective Operator Display Design Practices) to develop an implementation which was made a standard at Holloman Engineering. The use of neutral shades as primary symbol and process coloring keeps things in the background. When something needs the operator’s attention a color is used to pop it into the foreground. For instance, a tank level display normally does not use color, but when the level reaches a high alarm, the color changes to orange. The orange alarm color stands out against a gray backdrop and the operator focuses exactly where he needs. We show basic alarms in orange, but use red for critical alarms. Color is also used to signify when something may not be in alarm but is in an abnormal state. One such case is a controller that is in Manual as opposed to Automatic; we use a blue outline of a controller object, or a blue “M” to alert this situation. Website designed and maintained by Glendon Shaw; Copyright © 2010 all rights reserved.